I started running for distance again. Running is one of the toughest exercises in my round up. I typically have a 3-6 mile base, and for some reason I love to run hills! Hill sprints are my favorite! What is one way you make running fun? Here are 5 tips to get (back) to running! 1. Lay it out - Set out your clothes, you shoes, your PLAYLIST the night before or in the morning to make sure you are ready! 3. Be realistic - I tend to think since I have ran marathon before I can go out after a year and run 10 miles! Build up to your mileage. 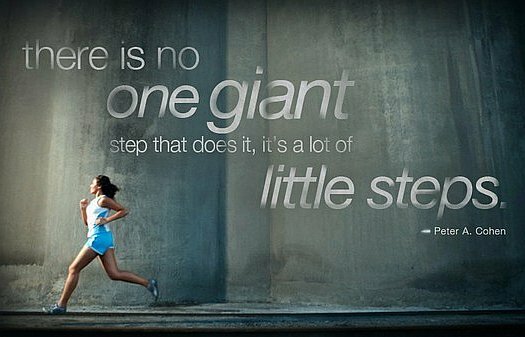 Incremental steps are the critical to avoid injury. 4. Strength and Cross-train - Working on different muscle groups, you can help muscle imbalances. This helps increase your longevity as a runner, +++ get a stronger body! 5. You don't have to go fast, you just have to go! I challenge you when you start to talk about your new running routine to avoid the, "How fast do you run" conversation. I want to change this mindset to, what is your pace or do you enjoy hills vs flat? When I run I do not use a GPS or tracker, I just go out and run.